There has been a lot of discussion happening on cover crops statewide and regionally. We know cover crops are used to manage soil erosion between normal crop rotations, but do cover crops pay? What seed types are most effective? Do cover crops increase yields? Management methods, planting dates, seed types, timing and weather all play a part. In an effort to answer these important questions and evaluate these variables, Yahara Pride Farms (YPF) offers cost-share assistance for farmers to try out different cover crops and is also working on a cover crop demonstration plot in partnership with UW-Extension’s crop and soils educator, Heidi Johnson and seed company Partners in Production. Through the cover crop demonstration plot, we have found that one of the most important factors to consider when planting cover crops is timing. The earlier you get your cover crops in after corn silage, the better. Planting cover crops before manure application after silage harvest works very well. Additionally, with low soil disturbance manure injection systems we can apply manure after the cover crop has been established. In 2015, the demonstration plot will be looking at the effects of cutting back on cover crop seed rates (full, ¾ and ½ rates) and eliminating the variable planting dates that we evaluated in 2014. The seed types that will be evaluated this year will be rye, wheat, oats, barley and the combination of barley and winter wheat. The cover crop combination that has been most effective for Endres Berryridge Farms is winter wheat followed by a mixture of peas and barley after the winter wheat is harvested in late summer. The winter wheat acts as a cover IN THIS ISSUE Planning for the long-term future Page 5 2015 Conference recap Page 6 New benefits for Yahara Pride Farmers Inset page Yahara Pride Farms 150 E. Gilman St., Suite 2600 Madison, WI 53703 www.yaharapridefarms.org crop throughout the winter months, while the peas and barley act as a cover crop for late summer and early fall. The cover crops prepare the field for the next spring’s crop and allow Berryridge Farms to grow three different crops in one year with only tilling the ground once. This also gives the option to incorporate manure after winter wheat harvest. Planting cover crops mid- to late-August allows enough growing season that the cover crop can be harvested in late October for forage. The peas and barley mix that Endres Berryridge Farms plants after winter wheat yields between one and a half to two tons of dry matter forage per acre. Jeff said, “The stubble and plant mass left behind after the cover crop harvest acts as a good cover for holding the soil and nutrients in place for the winter months, which opens the opportunity to no-till corn, soybeans or alfalfa the following spring.” Jeff also stated, “We like the barley best because it is fast growing, and has good feed quality. The pea and barley forage is fed to replacement heifers and helps lower feed costs by allowing us to use less high quality haylage.” The Endres brothers have gotten positive yield results from corn, soybean and alfalfa following the cover crops, with corn being the most successful. Sparked by the cost-share assistance provided through Yahara Pride Farms, the Endres brothers have been using the peas and barley combination of cover crops for three years now. Jeff said the cost-share program allowed them to experiment and try new things with cover cropping, which helped them find a good combination for feed and yield results. He also stated that cover crops give us an opportunity to tie up nutrients in soil through living plants, which is then released and available to be used by crops in the spring. Endres Berryridge Farms has increased acres of cover crops over the years to try different cover crop strategies following corn silage and Jeff thinks that the program is a great opportunity to see what technique works best for your operation. Greg said it has been a “very positive experience working with Yahara Pride Farms through the cost-share program” and that the program “gave him the opportunity to make a change.” Ziegler Dairy started using cover crops through the Yahara Pride Farms cost-share offering in 2012. They planted forty acres of winter rye and now have continued to increase their acres each year, planting a total of 350 acres last fall. As far as soil health, Greg noticed when he drove in with the planter the next year the ground seemed “so much softer.” On the knolls and hills he saw no visible washing. Prior to planting cover crops, Greg used to only maintain three to four weeks of manure storage and had to haul more frequently. Now he has increased storage and he thinks that the reduction in hauling, in combination with the cover crops, has resulted in a significant decrease in field compaction and faster soil warm up in the spring, leading to improved crop yields. Regarding termination of the cover crop, Greg recommends four to five inches of growth on the winter rye before you kill it off. “Using cover crops also resulted in a cleaner weed kill,” Greg said. Greg also said, “Sometimes it is hard to make a change in the way you farm but, this has been a very good [change] for us.” We are excited that farmers are seeing positive results and we thank all of the farms that participated in our costshare program for the last three years. 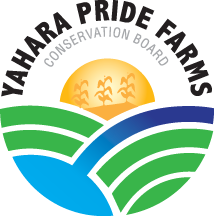 Thanks to the dedicated Yahara Pride Farmers, we are able to report acres far beyond what we cost-share each year.